A fine walk on rough paths led me around Clauchland’s Point. 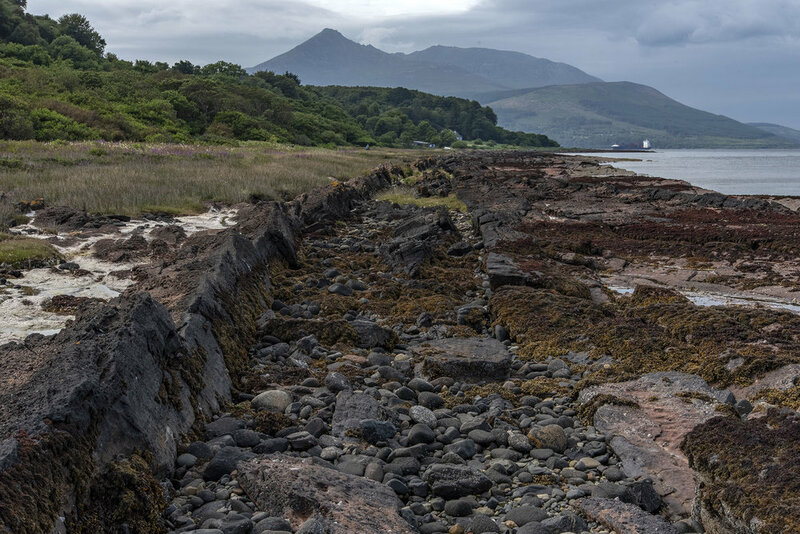 Geologically, this landscape is well-known as the place where exposures of the finest pitchstone on Arran are found. Pitchstone takes a number of forms, with some being less suitable for knapping into stone tools. 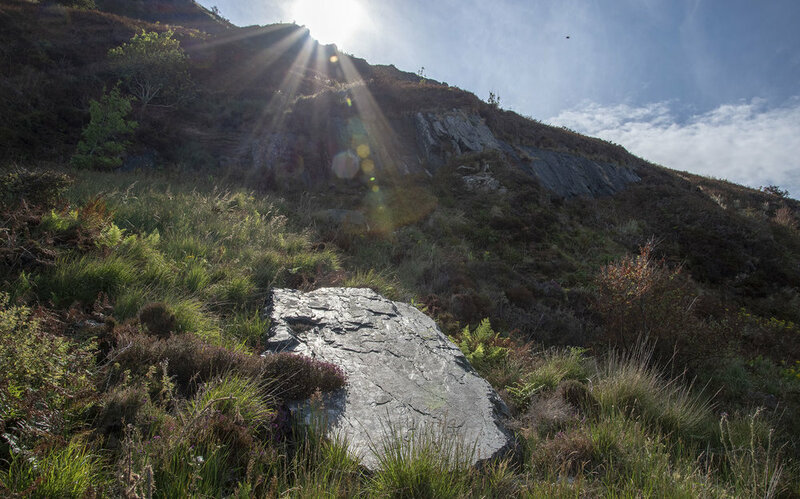 The pitchstone found here, on the east cost of Arran, is described as aphyric. They are of the highest quality, and the kind most widely used in the Neolithic. Pitchstone which originated in the vicinity has been found at Neolithic sites across Scotland. Frustratingly, the precise locations of these quarries have yet to be determined, but I was very interested to see the kinds of places which would have been encountered by Neolithic people visiting this landscape. Walking along the shoreline, I was at first unsure of whether I was in the right location. I could see banded outcrops above, but these were on steep ground and difficult to reach. Then, my eyes were drawn to a remarkable slab of rock which had fallen from the cliffs. It had a mirror-like surface which was reflecting the sun. I examined the slab, and found that its edges were naturally fracturing into a substance that looked like black glass. Further along the shoreline towards Corriegills, a distinctive volcanic dyke runs parallel to the shoreline for a considerable distance. The sides of this dyke are defined by steeply sloping slabs of sandstone, some of which have eroded into fantastic textures. Within the linear trough defined by the dyke were water-worn beach cobbles and boulders displaying the colours which I had seen so often on my journey, and in particular at the megalithic monuments: red sandstone and grey granite. Here, they were complemented by sparkling black pitchstone. These were the colours of Neolithic Arran.